Let’s be honest; we have all been susceptible to the feeling of aggression and anger — and preschool kids are no different. The thing is, as adults we have a better handle on our behaviors and do not let these emotions run amok. Preschoolers, however, may turn their rigor and energy into unbecoming, agressive conduct like biting, kicking, screaming, and even hitting. If your little one has a problem with aggressive or angry behavior, it is your responsibility as a parent to help him or her develop proper discipline, judgment, and the ability to express her feelings in an appropriate way. Here are 7 tested strategies that can help you address aggressive behavior exhibited by preschoolers at home or school. Kids are always watchful of what you do, and how you react to the feeling of anger and aggression. The last thing you want to do before your kid is to lash out in anger or show acts of aggression right before her eyes. Kids have a tendency to mirror the behaviors of older siblings or parents. You want to express your anger properly, and your preschool child will certainly follow suit. Even better, explain to your kid the importance of controlling your anger and any other form of aggression. You want to set consistent and firm limits of what behavior is permitted and what is not. Ensure that everyone who engages mostly with your little one (babysitters, siblings, etc.) know about these set rules. They should also know how to respond to aggressive behaviors. If the kid bits, hits or kicks, for example, she should be reprimanded pronto. This way, she will understand clearly that she has done wrong. Dealing with an aggressive kid can be quite exhausting. That is why you need to know how to respond appropriately. As such, the best way to respond to aggression and anger in preschoolers is to do it in a supportive and caring manner. There is no room for anger in your response. The idea is to make your kid feel loved unconditionally despite the aggressive behavior. That is why it pays to approach the behaviors in a manner that will not punish or shame your child. Think of yourself as a supportive coach who is out to calm down a child. The bottom line is to respond firmly but in a caring and supportive way. It is common for parents to swoop in as soon as they notice a child being aggressive. Sure, you want her to stop, but you need to give her some time to cool off. Don’t get me wrong; giving your kid time to calm down and cool off is not helpful in mending the unbecoming aggressive behavior; instead, it provides her mind the opportunity to dial back to its calm state. In this state, it is easy to talk things out without extreme emotions getting in the way. If you want to kick things up a notch, a few hugs are what the doctor prescribed. Some kids may also want to do something else like watch TV or play to come down. Self-control is an indispensable life skill that is best learned at a tender age. The problem is that pre-school kids do not have the innate ability to exercise self-control. It is something that needs to be instilled. That is, you need to teach your little one not to bite, kick or hit whenever she is wronged or feel like it. No matter how you look at, parents need to provide guidance on how to cultivate the ability to keep angry feelings under control. Your child should understand from a young age the importance of thinking about her actions before acting on a whim. Right off the bat, spanking a kid is against everything good parenting stands for. Unfortunately, it is not uncommon for some parents to use spanking as a form of punishment. That is a big no-no. You see, a kid who is punished physically has a tendency towards aggression. By spanking your child, you are showing her that physical aggression is okay. You don’t want her to think that aggression is the correct way to handle people when you don’t like their behavior or opinion. In fact, any form of physical punishment can encourage a kid’s aggressive behavior towards other people. Some parents are fond of encouraging aggressiveness in boys as a show of toughness. What you don’t know is that it leads your kid to believe that kicking, biting or hitting will gain your attention and earn respect. 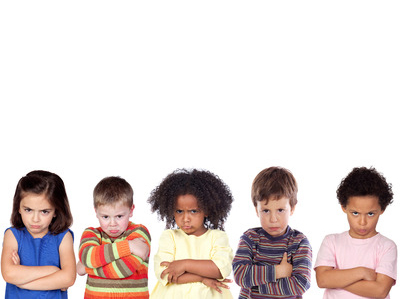 There you are – 7 important strategies for addressing aggressive behavior in preschool kids. You might also want to provide your kids the words to express herself properly.